1 of 1 In medium-size saucepan, combine onion, water, vinegar, sugar, honey and rosemary. Cover; bring to boiling. Reduce heat to medium; simmer, covered, 5 minutes. Uncover; simmer over medium heat, stirring occasionally, until onions are translucent and slightly golden, about 35 minutes. 1 of 4 Meanwhile, place rack of lamb on cutting board. In small bowl, stir together mashed garlic, rosemary, 1/2 teaspoon salt, black pepper, pepper flakes and oil to form thick paste. Rub onto meat side of lamb, spreading a small amount onto rib side. 2 of 4 Heat large ovenproof stainless steel skillet or saute pan (not nonstick) over high heat (no oil in pan). Once pan is very hot, place rack of lamb, meat side down, in pan; sear for 2 minutes. 3 of 4 Transfer pan to 425 degree F oven. 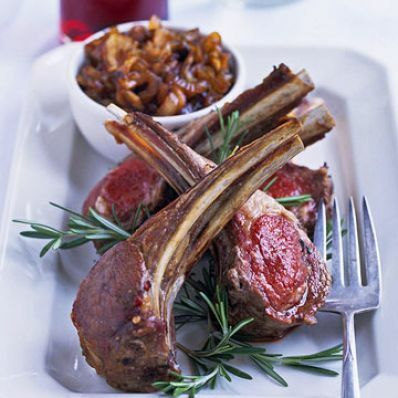 Roast lamb 25 to 30 minutes, depending on weight, until internal temperature of meat registers 130 degrees F to 135 degrees F on instant-read thermometer for medium-rare. Let meat rest in pan 10 minutes (temperature of meat will rise 10 degrees). 4 of 4 Slice rack apart between ribs. Divide among dinner plates, 2 ribs per person. Sprinkle with remaining 1/4 teaspoon salt. Serve with onion marmalade. Makes 4 servings.